About a month or so, I poked my head into Zascianek, a Polish restaurant on Belmont a few blocks west of Central. The bilingual menu with selections under veal, beef, pork and chicken seemed interesting--veal tongue anyone? Moreover, the place was packed (early on a Sunday night). I've been wanting to return since, especially as it is a lot closer than my darling Halina. The Condiment Queen and I had lunch there today. Yes, I am not gonna draw too much of a conclusion from one meal, but boy was it good. Really good. One must have soup at a Polish restaurant (no?). There are three regulars: chicken noodle, tripe and red borsht, plus a soup of the day. We went with the SOTD, pickle. And boy did it taste like pickle. I admired the high thriftiness of the kitchen that took probably those last pickles from the jar and combined them with a smooth and creamy stock (and a potato or two for contrast) to make a great soup. Then again, I do not think I have had a bad soup at a Polish place. I was curious to try the contractor's special, the menu has a lot of dishes that are mysterious in name. I s'pose it is something to keep you fortified for a hard day's worth (or reward you after a hard day's worth). It's an oblong potato pancake underneath a breaded pork cutlet, both the pork and the pancake are the same size. Next comes a ladle of mushroom gravy, finally two slices of cheese are melted on top. Out of guilt, I only at 1/2. It was like a Polish version of ReneG's Diner Grill Slinger. Good too. Crisply fried, fresh mushrooms, I could taste the potatoes in the potato pancake, and the cheese gave it a unifying element as it dribbled down. My wife ordered boiled beef with a horseradish-apple gravy. Sauce on the side was noted upon ordering but not in execution from the kitchen. The meat was a tad stringy but in a good way. It came with two mounds of pure mashed potatoes topped with fried onions. Both dishes came with a tri-part mix of homemade salads. The woman in the kitchen, Anna I believe, was glad we came. We talked chow a bit and she showed me what her dumplings looked like. I am eager to continue the relationship. *I took the name off the middle of the busines card, but some off-line discussion made me realize I copied the wrong line. Also, there is different name on a plaque above the restaurant--the correct name is painted on the window. Last edited by Vital Information on April 4th, 2005, 11:39 am, edited 2 times in total. Vital Information wrote: We talked chow a bit and she showed me what her dumplings looked like. This place sounds great. Can you elaborate on the mysterious sounding things on the menu? Any fish offerings (or else, for me , it's the hair-shirt )? And... do they have a license? Or put another way, do they serve beer etc.? We talked chow a bit and she showed me what her dumplings looked like. But I wish that I had written that line. It's a classic in food writing. This from a guy who just posted pictures of Naked Tamales. Antonius, there was no take-out menu, so I am somewhat at a loss to describe things not ordered. A lot of the menu was like the "contractor's special", like what is French style cutlet per se? I think, for instance, that the boiled beef the CQ had came in Vienese sauce (apple-horsradish). It is gonna take a few more visits for me to get my arms around stuff, and they promised a take out menu soon. There are a few fish dishes IIRC. The place does not serve liquor. I have the feeling that it's like Halina's, tolerant of BYOB but not really encouraging it. Rob, this place sounds great, thanks. Tell us more about the dumplings. Not pierogi, then what are they like. Also, I wish I could say that I've never had a bad soup at a Polish place, though your sentiment is basically correct. You wonder why everyone can't make soup. But the thrifty, from-scratch mentality of the Polish cook really lends itself to good soup. The duck's blood soup at Orbit lives in my nightmares as the exception that proves your rule about Polish soup. The lukewarm, clovey and sticky-sweet pitch was terrible. If you were to take these dumplings and put them in, say, a cup, what size cup would you need to hold her dumplings? Through some correspondence with the brilliant one, we realized that the dumplings are "schlesische kloesse." Raw, they look a bit like dim sum bbq pork buns. I do not know what they look like cooked. Tak, slusznie. * Yes, Anna, I can only agree (on the basis of familial lore, book lore, internet lore). And, to pay homage to one of my favourite journalists in Chicagoland, Monica Eng, dumplings (luckily) know no borders. The raw-potato dumplings need to be boiled much longer than the other two sorts (ca. half hour vs. quarter hour: like the presumably now better known in America gnocchi, they all float when they're done. 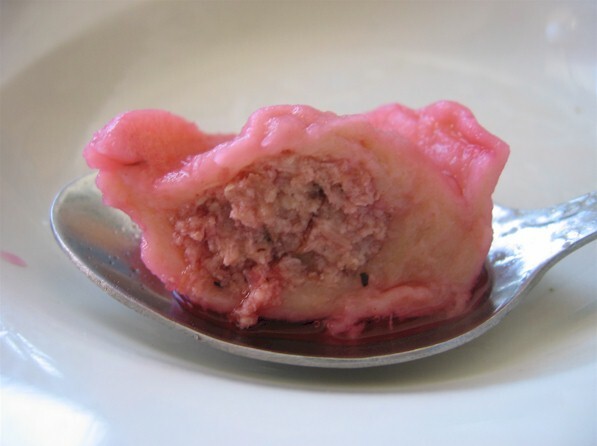 Kopytka ('little hooves') is, I believe, the Polish name for a non-filled dumpling compositionally very similar to the German Silesian 'Kartoffelkliessla'. Does that sound right to you, Anna? Wie der Schreiber unjefähr sagt: gummi is' (mindestens in diesem Fall) jummi. Corrections, additions, emendations welcome (if they're offered politely ). * Sorry, I can't produce a barred 'l' here, but that's what's supposed to be there in the second word. Last edited by Antonius on April 24th, 2005, 3:48 pm, edited 1 time in total. Antonius--I think you've mentioned every version of potato dumpling of the region! The foods of that part of Europe are all intermingled due to the constantly shifting borders. The other night myself and several other chowhounds and chowhounditas went to Zapraszaja for a little dinner and floor show [had to be there to see the kidz do some kinda Supreme's type of dance routine.] We tried more soups, chicken noodle, tripe, mushroom, dishes done with potato pancakes and regular pancakes, two variations of chicken breast and other fried things. It was all good and satisfying, although I've had better goulash (too much sour cream muted the flavors). Still, as foreshadowed the other day, come to see the dumplings. We were all very keen on trying the Silensian dumplings. And these turn about to be about the lightest potato based product you will ever taste. They look like big globs of stiff mashed potatoes, but when you bite in, it take a few seconds for your teeth to hit anything. After that pause through light goo, where you take in the earthy mushroom gravy, you hit a firmer layer. This mantle yields gently to the mouth, leaving a wonderful contrast of chew and air. It is possible to get other gravies besides the mushroom. Essentially, think of these as giant, better than gnocchi, gnocchi. And as good as the dumpling were, the pierogies were better. They did not come out until late in the meal, and I am not sure if they make the entire package to order or it was just slowly cooked. The wrappers were so clearly homemade, so exquisitely, perfectly flawed. Dough wrapped just to the point of breaking, and you could taste where the hand had fixed any over exuberance. The pierogies were equally light and substantial. A sauce of clarified butter with just enough long cooked onions for sweet-bitter contrast set things off right. If the filling was junk, these pierogies would have still tasted great, but needless to say, the fillings were good too. There are certain small, apparently unpublicized (yet hardly unknown) places, La Quebrada, Spoon Thai, this place, that it just takes one or two visits to know the place is special. I will always adore Halina's for simple and delicious Polish food, but I will continue cheating on her for sure at Zapraszaja. The word "zapraszaja" is used on the restaurant's 'signage' in a way that makes it look like the name of the place but it seems that it's just an apt calling of attention to the hospitality that one finds there: the word "zapraszaja" means 'welcome' (according to the waitress) and the actual name of the restaurant is "Zascianek" (with accent marks on the 's' and 'c' indicating palatal consonants, not available to me in this font). At least that's what I gather from the format of their business card. But this is such a neat place, maybe it deserves two names. Many thanks for introducing us to this little gem. The pierogi were really outstanding and the Silesian dumplings were also really nice: properly light but also sort of gummy (in a good way -- please see my post on dumplings above). 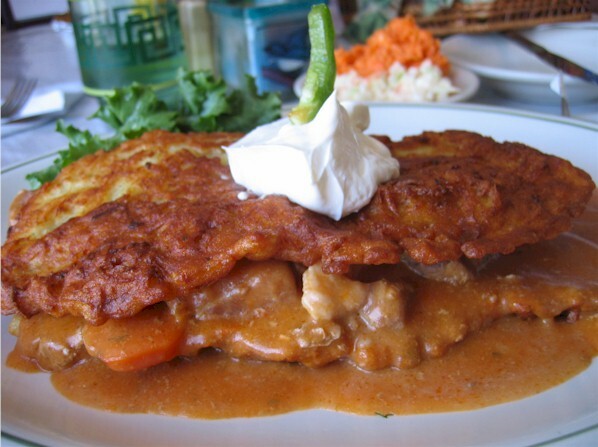 The whitefish I had there was simply prepared and quite delicious and the taste of "potato pancakes Hungarian style" (a goulash sandwich, as it were, with potato pancakes serving as the frame) convinced me I must return as soon as Lent is over. The cabbage and beet salads were also winners. My one complaint is that the mushroom barley soup was a tad overly salty to my taste. Beyond the fine quality of the food, the restaurant also has a very nice atmosphere -- a simple sort of friendly, no-nonsense eatery that one finds throughout northern Europe. The waitress was also a real sweetheart, putting up with and answering our endless questions with a genuine smile. And did anyone mention that it is insanely cheap!?! Mrs. JiLS and I enjoyed Sunday lunch today at Zascianek, focusing for our first visit on some of the dishes Rob posts about above, plus one other chicken dish that was also very good. 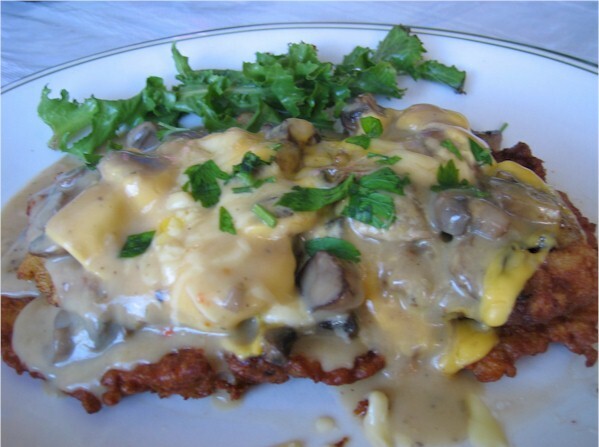 Specifically, I had the Contractor's Delight (breaded pork cutlet on a plate-sized potato pancake, smothered in American cheese, Monterey Jack cheese and mushroom gravy). This was a fantastic potato pancake, one of the best I've ever had (although I haven't tried a Resi's Tater Man yet, so that's next on my list). I was eating this pancake like there was no tomorrow, even after inhaling maybe 18 regular sized latkes at Seder dinner Saturday night. Mrs. JiLS ordered the "cucumber" soup (actually the pickle soup Rob refers to above) and this was the highlight of the meal for her; I also liked the combination of rich, hearty potato soup and tart pickle accents. Mrs. JiLS had the King Style Chicken, an entire breaded (pounded) chicken breast cutlet, served with sauteed red peppers, onions, mushrooms, parsley and a liberal dose of melted Jack cheese. This dish could only be improved by adding one of those monster potato pancakes. Almost forgot to mention the cold salads that started us off, which consisted of small plates of creamed cucumbers, shredded beats and coleslaw, all very good and, I discovered, even better if you mix them together into a cold-salad stew and eat all three at once. All of this food (enough for four people) was just $21.00. Wow -- "insanely cheap," indeed, Antonius! By the way, the waitress was somewhat impressed that I already knew what I wanted to order, and I said a friend had provided some guidance. She asked if we had Polish friends, and I replied no, just people who really like to eat (which elicited a chuckle). She seemed amazed anyone not from the neighborhood had heard of the restaurant; I directed her to check out this forum and see what good things people had to say. As I was leaving for the Polish American Museum today, I found Rob's initial post and hit print. I didn't intend to print 11 pages, I only wanted the original post and now I am sorry I didn't wait for the printer to finish. I would have had a better idea on a few items I tried to learn about. I was quite hungry when I arrived, so I ordered the soup of the day, which was mushroom in a creamed base with macaroni. When the price difference between small and large was a mere 30 cents over $1.50, I got pretty expansive and ordered the large. The bowl of soup presented was akin to Tank's extra large Pho without all the noodles and meats. My Mother had the small, which was about the size of soup noodles at Seven Treasures. A very nice well balanced flavor of mushrooms and cream, though portions to kill the appetite of an army. My other Mom ordered the "Red Borsch with uschka or meat eggroll" [Barszcz Czerwony (Krokiet Lub Uszka)]. This was a clear beet broth with meat filled dumplings visible below the surface for a mere $2. I surmised this was a potato dumpling and asked the waitress if this was similar to a Gnocchi. She provided a vague answer which could be interpreted I was perfectly correct or she was affirming something she really didn't understand. Not clear myself, I decided to forgo Silesian Dumpling on this occasion. Instead, I ordered the Potato Pancake Hungarian Style (Placek Po Wegiersku) for $6.99, which I knew was going to be huge based on Contractor's Delight having the same cost. This was a double potato pancake with a pork Hungarian goulash inside. The crust of the potato pancake didn't let the sauce penetrate too easily, which allowed it to retain its crunch. I could eat no more than 50%, before it and soup caused me to raise the flag. Intrigued by Rob's Contractor's Delight (Przysmak Kontraktora), I talked my Mom into ordering it. This only had one potato pancake, the pork cutlet, cheese and mushroom gravy. I think the cheese was gilding the lily and would likely forgo it, then again it was still pretty good as-is. In some respects, I liked the Contractor's Delight more than my choice because I liked the drier composition to appreciate the potato pancake more. As JiLS pointed out earlier, these are really excellent potato pancakes. The Other Mom ordered Pierogi with potato and cheese (Pierogi Ruskie) for $5.99, which sadly did not meet her expectations. I tried them, though I wasn't exactly excited by the filling of potatoes and farmers cheese (at least that is what I thought the cheese may be), they were otherwise handmade with generous quantity of filling. This Mom will boil, drain and pan fry her pierogi, whereas today's pierogi were boiled with sauteed onions added. She also thought there was too much fat in the bottom of her dish. As I said, with a different filling, these Pierogi were perfectly acceptable to me. While attempting to obtain a take-out menu, I checked out the food on other tables. One woman had two very large blini's with a large dollop of sour cream and apple sauce. Her companion had a robust meal, which looked very good. Our total bill for our meal with a couple of Cokes was just short of $27 and leftovers for another substantial meal. I don't know Halina, but I am happy to be acquainted with Zascianek. Thanks Rob for an excellent find! Tried Zascianek last night with a friend and we were both delighted. We started with the red borscht with uschki (little meat dumplings), about which my friend said, "I thought there might be one dumpling." There were 5 in our "small" bowls. The borscht was just on the cusp of being too sweet, but the savory dumplings helped bring the soup back from the edge. Since everyone on this thread has raved about the potato pancakes, I made sure to order them for both of us, but due to a miscommunication (on my part), rather than getting a separate side of potato pancakes, we each got two potato pancakes on our entree plates instead of mashed potatoes (which have also been invitingly described here). My friend ordered the king-style chicken (described elsewhere in this thread by JiLS). I enjoyed my taste--crispy chicken cutlet and savory sauteed vegetables--but the cheese was a bit much for me. For dessert, I chose the cheese pancakes, wondering if these would be anything like my Hungarian grandmother's polachinta (that's not how you spell it in Hungarian, but that's how it sounds), but they didn't have 'em. Then I tried ordering the pierogies with blueberries, but they didn't have these, either. So I ordered the cheese blintzes, as recommended by our waitress. Where have such blintzes been all my life? I guess they have been in Poland. And probably Paris. For these were not the blintzes of Jewish delis. They were two enormously long rolled crepes, stuffed with sweet dry yellow cheese, drizzled with chocolate sauce, and dolloped with sour cream. Yum! But we couldn't finish these any more than we could finish our entrees. I came home with two packed styrofoam containers and anticipate at least two meals (and desserts!) out of what's left. I think our total bill was $26. As we were waiting for the bus afterwards, my friend asked, "How can they afford to charge so little?" Cheap rent? Or is there some price-time-warp in this neighborhood, which looks like it could have been much the same 30 years ago? I surmised this was a potato dumpling and asked the waitress if this was similar to a Gnocchi. She provided a vague answer which could be interpreted I was perfectly correct or she was affirming something she really didn't understand. Yeah, they are somewhat similar. These dumplings are made with potatoes, eggs, and potato starch. If they're correctly made, they should be surprisingly fluffy and delicious. My aunt just made some for me this past weekend. I was in heaven. You need to serve them with a dish with lots of gravy--particularly mushroom gravy. A dish more similar to gnocchi in Polish cuisine is kopitka. 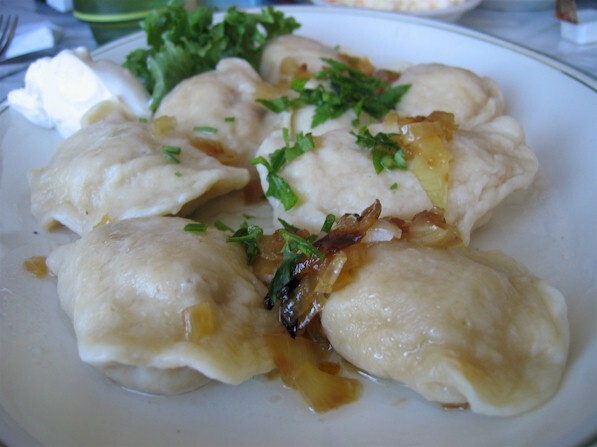 Incidentally, the Silesian dumpling is essentially the same as the German kartoffelklösse, if you're familiar with that. The Other Mom ordered Pierogi with potato and cheese (Pierogi Ruskie) for $5.99, which sadly did not meet her expectations. I tried them, though I wasn't exactly excited by the filling of potatoes and farmers cheese (at least that is what I thought the cheese may be), they were otherwise handmade with generous quantity of filling. That's right. Ruskie Pierogi ("Russian Pierogi") (EDIT: That's supposed to be "Ruthenian Pierogi.") are filled with a combination of potatoes and bialy ser, white cheese (and onions). White cheese can be loosely translated as "farmer's cheese," but it's a little different in taste and texture than what I get at the grocery store labeled as farmer's cheese. They are my favorite pierogi. Yeah, it's a lot of starch, but I prefer them to meat, sauerkraut, or mushroom pierogi. This Mom will boil, drain and pan fry her pierogi, whereas today's pierogi were boiled with sauteed onions added. She also thought there was too much fat in the bottom of her dish. As I said, with a different filling, these Pierogi were perfectly acceptable to me. Last edited by Binko on December 21st, 2012, 1:41 pm, edited 1 time in total. When I had the Ruskie Pierogi ("Russian Pierogi") for breakfast the next day I detected the onions. The bialy ser, white cheese, is the same as Russian tvork, isn't it? The decision to go to this restaurant was made as I was leaving. I accidentally printed the entire thread, but left after the first two pages had printed. Once I read Antonius description of the Silesian dumplings when I returned, I regretted not choosing them. I saw another table with those long, beautiful blintzes, another reason to return! I think this deserves a group visit simply to share food and explore the menu. The silver lining, I will gladly revisit Zascianek sometime soon. I should add to this thread that we recently visited our spurned friend, Halina. Better? Can't really say, the menu's differ, and the things that are cool at Zascianek like the contractor's special are not at Halina's. Still, Halina's soups are just superb. At our lunch the other day, we tried cucumber, mushroom, chicken noodle, and Ukranian borsch, each as good as the last. We surely have no shortage of good Polish restaurants in Chicago. I don't know what the Russians call it, but it's a fairly ubiquitous cheese in Eastern Europe. It's turo (with accents over the u and o) in Hungarian. It can be eaten either either sweet or savory. In fact, one of the most popular candy snacks in Hungary is a sweet concoction called Turo Rudi: a finger-sized cylinder of this cheese dipped in milk chocolate. Yummy! 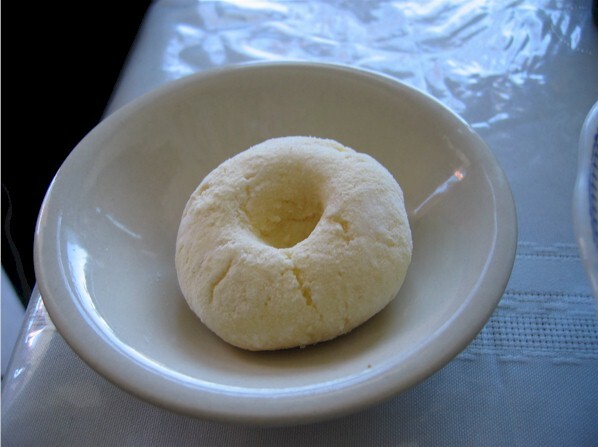 Bialy ser/turo is something like ricotta, except ricotta is generally made from whey and the curds are bigger in bialy ser. It's generally made from cow's milk, although I have seen it made from ewe's milk, especially in Hungary, where it's known as juhturo. It's not pressed, like farmer's cheese. Another close cousin would be cottage cheese, but it's not as wet as cottage cheese. When I made fresh bialy ser, I simply waited for unhomogonized milk to naturally sour and curdle, and hung it in a cheese cloth overnight. I believe you can also make it by adding lemon to warmed milk, allowing it to curdle, and hanging it up. Most decent Eastern European groceries in Chicago will carry it. Bilko wrote: When I made fresh bialy ser, I simply waited for unhomogonized milk to naturally sour and curdle, and hung it in a cheese cloth overnight. I believe you can also make it by adding lemon to warmed milk, allowing it to curdle, and hanging it up. From your descriptions of bialy ser and turo, I am certain tvork is the same product. In another phase of my life, I spent considerable time in Moscow, USSR. Fresh milk was often transported in unrefrigerated trucks, so it was sour when you purchased it. To retain any value, I was often making tvork by gently heating the soured milk until the curds separated from the whey, then straining them in cheesecloth. If I wanted to force the issue to milk which wasn't yet spoiled, I would add kefir to the milk and heat them gently. The locals were endlessly surprised when I extolled the virtues of the local sour cream, which I still feel was the best I ever had. Cathy2 -- Yep, from your description is does sound like we're indeed talking about the same thing. Which brings me to a question: Are there any Georgian places in the Chicagoland area? Binko wrote: Yeah, they are somewhat similar. These dumplings are made with potatoes, eggs, and potato starch. If they're correctly made, they should be surprisingly fluffy and delicious. My aunt just made some for me this past weekend. I was in heaven. You need to serve them with a dish with lots of gravy--particularly mushroom gravy. A dish more similar to gnocchi in Polish cuisine is kopitka.